SPRINGFIELD, Mass. (May 12, 2015) — Smith & Wesson Corp. announced today that select J-Frame Models (Model 642, Model 442, Model 637 and Model 638) are now available with a factory installed LaserMax CenterFire laser sighting system. 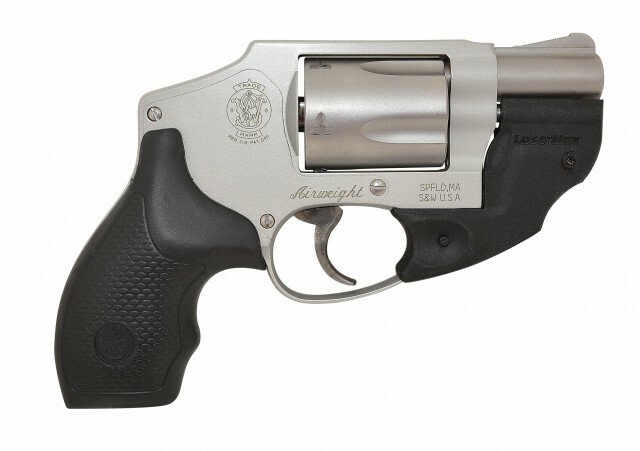 Adding enhanced versatility to this popular line of small frame revolvers, the new models extend the company’s line of self-defense firearms. A stable in the Smith & Wesson line since 1952, the J-Frame revolver has served as a trusted backup gun by law enforcement professionals and as a primary self-defense firearm by thousands of licensed permit holders. In January, Smith & Wesson began offering one of its most well-liked revolvers, the Model 642, with a LaserMax CenterFire sighting system. This popular feature is now available on three additional lightweight J-Frame models. The addition of the LaserMax laser sight helps enable positive target acquisition and enhanced accuracy in low-light conditions, making it a valuable accessory for any personal protection firearm. The factory installed CenterFire laser is custom designed to fit the revolver frame. Located under the bore, the new sight features LaserMax’s signature Controlled Activation™, which enables the user to operate from concealment without revealing his or her position. The LaserMax laser incorporates advanced functionality including improved ambidextrous tap-on/tap-off activation, a 10-minute auto time-out feature and the ability to switch between a solid or pulsed beam. New models available with the LaserMax system include the Model 642, Model 442, Model 637 and Model 638. Smith & Wesson Holding Corporation (NASDAQ Global Select: SWHC) is a U.S.-based leader in firearm manufacturing and design, delivering a broad portfolio of quality firearms, related products, and training to the global military, law enforcement, and consumer markets. The company’s firearm division brands include Smith & Wesson®, M&P®, and Thompson/Center Arms™. As an industry leading manufacturer of shooting, reloading, gunsmithing and gun cleaning supplies, the company’s accessories division produces innovative, top quality products under Battenfeld Technologies, Inc., including Caldwell® Shooting Supplies, Wheeler® Engineering, Tipton® Gun Cleaning Supplies, Frankford Arsenal® Reloading Tools, Lockdown® Vault Accessories, and Hooyman™ Premium Tree Saws. Smith & Wesson facilities are located in Massachusetts, Maine, Connecticut, and Missouri. For more information on Smith & Wesson, call (800) 331-0852 or log on to www.smith-wesson.com.